My observations from watching the Assassin's Creed Movie frame by frame. Please note that many of the images are open to individual interpetation, and can only be seen for a split second in the movie. In the Assassin base we see a table with what looks to be the parts needed to construct a hidden blade. At the initiation ceremony, we see several older men wearing white robes. Potentially members of the Assassin Council. Aguilar has a finger on his right hand removed. 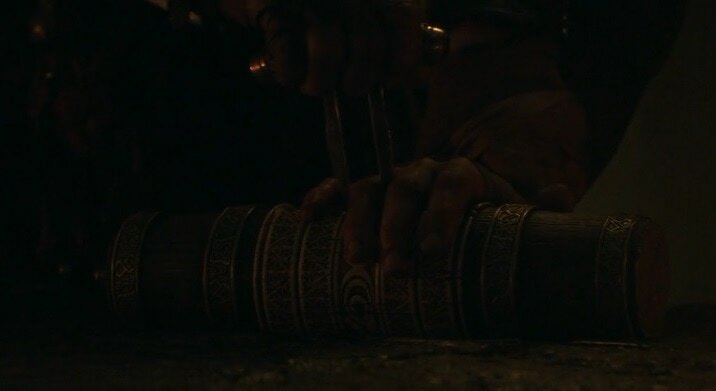 This is the first time we have actually seen an Assassin have a finger removed. The Assassins use a special chopping block to remove fingers. UbiWorkshop Templar Cross in Alan Rikkin's car. 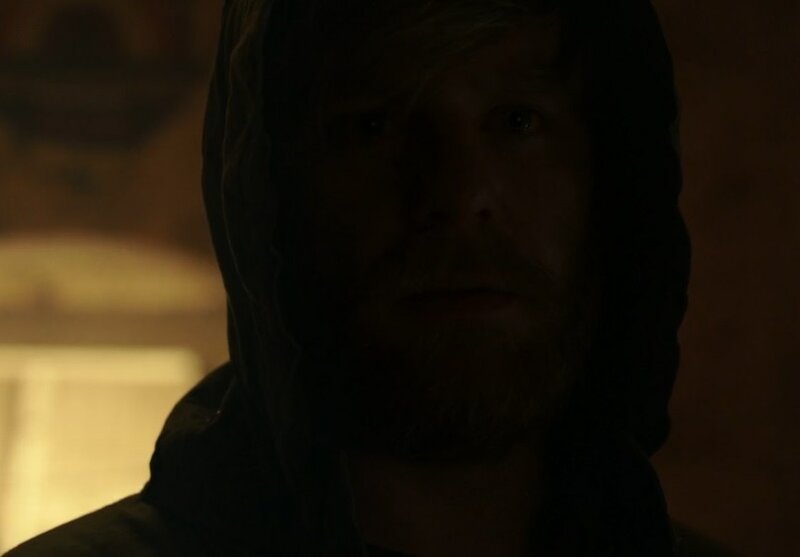 Young Cal has his hood up, forshadowing his future. Assassin necklace covered in blood. The drawing on the left looks like a pyramid to me. Could it be a hint? Many of Cal's drawings are of the Spanish Inquisition. We can clearly see Tomas de Torquemada in several of the images. 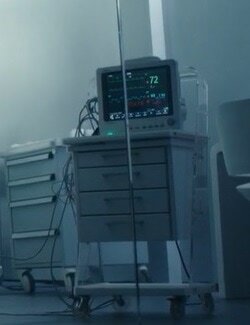 The number 72 can be seen on the machine. 72 is an occuring number in the Assassin's Creed Franchise. Examples: - It took Haytham 72 days to reach America. - 72 was the password to gain access to the Colosseum Vault. -Desmond Miles was born on the 72nd day of the year 1987. Nathan does gardening at the Abstergo facility. 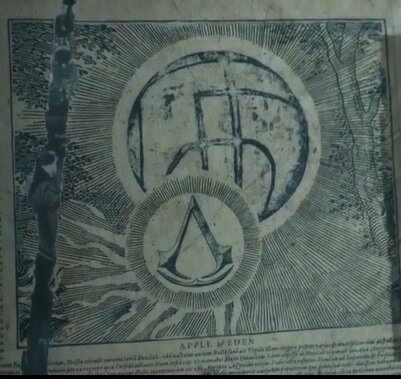 Alan Rikkin has a copy of Altair's Codex in his office. An unknown person watches Cal on the monitor. Who could it be? Ancient Manuscript showing the Apple of Eden. Bottom left image on the newspaper article show's the room where Cal's mother died. Notice that her body has since been moved. Assassin on the wall in Sophia's office. Louisiana, USA. 1861. Could he be one of Cal's ancestors? Several people have speculated that the image of the right looks more like Connor than Aguilar. "Aguilar de Nerha. Remains found at excavation ref 42502" 1455-1526. Aguilar lived to be 71 years old., and died 2 years after Ezio. "Aguilar de Nerha. 15th C. Member of the Spanish Brotherhood. He wore robes bearing Moorish influence. Wielded 2 hidden blades." Sophia's mother, who was apparently killed by an Assassin. Models of the Apple of Eden. 1+2 show the Apple with the exterior still on, and 3+4 show the Apple Core. Sophia examining an Assassin under the microscope. Smoke bombs in Sophia's Office, all bearing the Assassin Insignia. Notice that the pin is also an Assassin insignia. Closeup of the weapon Nathan uses to attack Cal. Nathan's Hidden Blade also features a projectile mechanism. The Apple shell crumbling away, revealing the core. The Movie Apple projected a green light, something that has not been seen in the games.